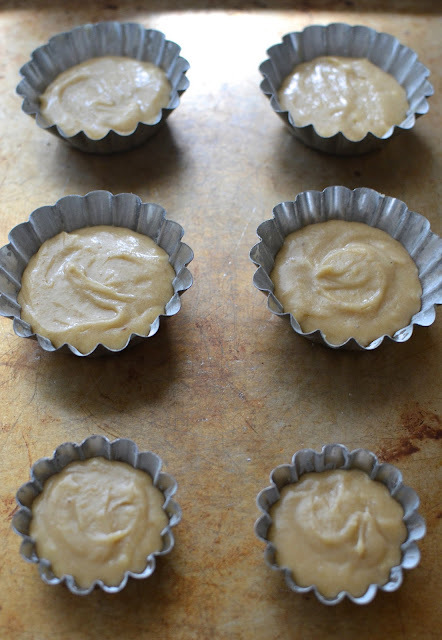 Naturally, I thought of using a mini muffin tin but then I had the idea that it might be nice to bake the batter in mini tart tins. So that's what I did, turning what should have been madeleines into what I'll call, tea cakes. A couple of my tea cakes are about 2 1/2 inches in diameter while the others (4 larger ones in my small batch) were slightly bigger at about 3 1/2 inches wide. I would've preferred them all in the smaller size but I discovered I only had two of the smaller tart tins so I was out of luck. I filled the larger ones a little less so as not to end up with very thick tea cakes. I was aiming for dainty. Now let me tell you why I wanted to make these so much...yes, it was the chestnut cream factor. I do love myself some chestnuts and love finding recipes like this one that use chestnut cream. 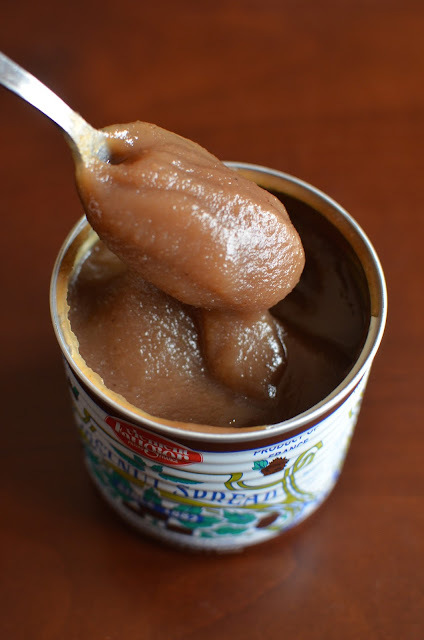 And since I have a pretty substantial stash of chestnut cream in my pantry right now thanks to my sister, who stocked up for me on a recent trip to Paris, I'm really on the lookout for good recipes. This chestnut cream madeleine (or "tea cake") recipe fit the bill and was all the more appealing given how easy the batter is to put together; we're talking bowls and some good old-fashion stirring. I divvied up the batter into my tart tins and these small tea cakes emerged from the oven. I was happy. These little cakes are just simple and lovely. They're moist, with an unmistakable flavor of sweetened chestnuts from the chestnut cream that made me smile. Also lightly flavored with a touch of vanilla extract and rum, these little bites were just what I was looking for in a mid-afternoon tea cake. Whether with tea or coffee, they are a lovely little sweet treat for any chestnut lover. As far as key ingredients go, here's the chestnut cream. Clement Faugier is a well-known maker of it and you can source it from Amazon. The batter is a simple mix. If you use a kitchen scale, it makes the process and cleanup even easier. If, unlike me, you have a madeleine pan, you can fill your pan after the batter is mixed together and make chestnut cream madeleines. Otherwise, a mini muffin pan and tart tins are the other options I'd consider. I like the fluted edges from the tart tins. Not only does it look pretty, you get nice crunchy edges on the cakes. I divided the original recipe in half. Ideally, I would've liked to use mini (2 1/2 inch in diameter) tart tins for all the batter and there should be enough batter to fill at least 10 of those. Since I only had 2 of the smaller tart tins, I filled the rest of the batter into larger one (I bought them for making Cantonese egg tarts). Be sure to thoroughly butter and flour the tins, especially if they do not have a removable bottom (the ones I used did not). Fill the tins up only about half to 2/3 way up since the cakes do rise and puff up during baking. Mine did not brown very much in the oven but they are done when puffed and spring back lightly when gently touched; a cake tester inserted in the cakes should come out clean, too. This recipe was originally for madeleines. I divided the recipe in half and baked the batter in small tart tins, thus, tea cakes. If you have a madeleine pan, go ahead and use it accordingly. Preheat oven to 400 degrees. Prep tart tins by thoroughly buttering and then coating them with flour, tapping out the excess (or spray with baking spray). Set on top of a baking sheet. In a bowl, whisk the chestnut cream, butter, rum, and vanilla together. In another bowl, whisk together the sugar and egg. Add the flour, salt, and baking powder, stirring with a wooden spoon or rubber spatula to combine. Add the chestnut cream mixture into the flour mixture. Stir together until just incorporated. Fill tart tins about 1/2 to 2/3 way full with batter, smoothing out the tops. Bake at 400 degrees for 5 minutes, then turn oven temperature down to 350 and continue baking for another 8 minutes. Baking time will vary slightly depending on size/shape of your baking tins (I found that the larger tart tins needed an extra 2 minutes). The tea cakes are done when puffed and spring back lightly when gently touched. They will be slightly golden and a cake tester should come out clean. Let cakes cool in their tart tins on a wire rack until cool enough to handle. Then tap the bottom of the tins and remove cakes from the tins. Let cool on a wire rack. Dust with confectioners' sugar before serving. I go make some tea! These tea cakes are so beautiful and delicious, Monica. haha, yes...put the kettle on! You are brilliant! I love these and they are so beautiful. I clicked on your website at the same time I was taking a sip of coffee waiting for it to load. Immediately I wanted one and can only imagine how fantastic they taste along with my coffee. I love the extra little crunch around the edges. If we lived closer I would loan you my madeleine pan because I don't seem to be using it! I have to try the chestnut cream one day - you do marvelous things with it! I am also a big fan of Mimi Thorisson's blog. What a life they live! I'm going to relish this because no one else is ever going to call me "brilliant" again! ; ) That crusty edge edges is so good...these and madeleines are so like financiers, except financiers *really* turn out with a golden crisp edge since there's more butter involved. I'm starting to drool...and yes, Mimi's life is amazing. More power to her and I hope to learn more chestnut recipes from her! These little cakes are adorable! I really need to get my hands on some chestnut cream.... I can just image how delicious these must be with some coffee or tea! PS I love that mug in the photos - so pretty! I missed out on the plate...it's from Anthropologie...I wanted the plate and somehow they were sold out so at least I grabbed the cup. These little cakes look delicious and the chestnut cream sounds fabulous. Hi Monica, love these beautiful delicate little cakes, you are the best baker, wish I lived near you! I think it must be the "trick" of the camera. Believe me, I'm sure you're just as good a baker as I am. These chestnut tea cakes look so good, delicate and elegant...I have never heard of chestnut cream...thanks for the link Monica. I know you use chestnut a lot. I have to try one of your recipe.These tea cakes look lovely. where do you get chestnut cream? What a clever idea in place of a madeleine tin! Have you tried a chocolate chestnut cake? It's so simple but delicious (I've got a recipe on the blog if you're curious). The tart pans came in handy...i'm glad to put them to use. These are so pretty and what a nice way to use chestnut! Thanks; I'm a huge fan of all chestnut things. Such deliciously baked cakes! I haven't had enough chestnut desserts, clearly! Dainty and so sweet. You know I was just looking at those little sweet tins in the grocery store the other day and wondering what they are used for. I love chestnut cream and these certainly would be beautiful for a little tea party or just inhaled by 2 hungry teenage boys. Love that you used mini tart tins! They look so dainty and pretty!